Saint Joseph's Institution is the oldest Catholic boys’ school in Singapore and was founded by the Christian Brothers (formally known as the Institute of the Brothers of the Christian Schools). 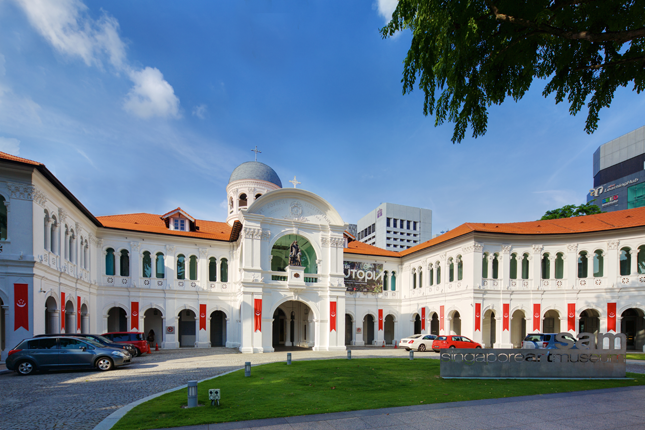 The former school building on Bras Basah Road not only testifies to the crucial role the brothers played in the development of the local education system, but also to the spread of Catholicism in colonial Singapore. In 1851, Reverend Father Jean-Marie Beurel, a missionary from the Society of Foreign Missions of Paris (MEP) and a relentless proponent of Catholic education, received instruction from the then Vicar of Malaya Bishop Jean-Baptiste Boucho, MEP, to recruit teachers for the mission in Singapore. He set off for France, where he successfully sought help from two teaching congregations: the Institute of the Brothers of the Christian Schools and the Congregation of the Holy Infant Jesus (CHIJ, or the Dames of Saint Maur). The CHIJ Sisters later founded the Convent of the Holy Infant Jesus on Victoria Street. Three de La Salle Brothers (as the Christian Brothers were also called, after the founder of their congregation Saint Jean-Baptiste de La Salle) started a free school, Saint John's Institution, in a small former chapel made of wood and attap on Bras Basah Road on 1 May 1852. While the school was intended mainly for the education of Catholic children, it also welcomed other children irrespective of religion, race, and social class. Brother Lothaire, one of the brothers accompanying Father Beurel on his return journey from Paris in 1852, designed a new building for the school. The cornerstone was laid on 19 March 1855, the feast day of Saint Joseph. Consequently, the name of the school was changed to Saint Joseph's Institution to commemorate this significant milestone and auspicious event. The two-storey rectangular structure was completed only in August 1867, topped with a pitched roof and a small belfry in the middle. By the start of the twentieth century, Saint Joseph's Institution had already established itself as one of the most prestigious schools in Singapore. The school’s results in public examinations were very encouraging; enrolment increased rapidly and more brothers were recruited. Classrooms were overcrowded, and the need for expansion became acute. The task of expanding the school fell on the new Irish-American director, Brother Michael Noctor, who assumed the position in 1900. After consulting the renowned architectural firm Swan & Maclaren, Brother Michael abandoned the plan to add a third storey onto the existing building. Instead, he approached Father Charles B. Nain, an amateur architect and the then assistant parish priest at the nearby Church of Saints Peter and Paul, for help. The talented priest was also responsible for the design of the Former Convent of the Holy Infant Jesus and the Church of the Nativity of the Blessed Virgin Mary. Father Nain designed two semi-circular wings, one on each side of the old block. The spacious verandahs of the new extensions are lined with arched openings. By enlarging the verandah on the front of the original structure, a porte-cochere (carriage porch) was created. A pediment bearing the name of the school and its crest was also added to the old block in the middle, and was repeated at both ends of the newly built wings. The original belfry was replaced by a larger dome, which was more proportional to the enlarged façade. In 1906, Brother Michael decided to embark on yet another building project to cope with the ever-increasing enrolment. Donations streamed in from the European and Chinese communities. Among the donors were Tan Jiak Kim (陈若锦), a prominent Straits Chinese merchant who was instrumental in the founding of Singapore’s first medical college in 1905, and then Governor of the Straits Settlements Sir John Anderson. This time, Brother Michael engaged the engineer Robert Hamilton to design the new wing. The completed three-storey rectangular block was ceremoniously opened on 3 August 1907 by Governor John Anderson, in whose honour the new building was named. Anderson Block echoes the architectural features of the school’s curved extensions. However, the simpler Doric columns and pilasters give the block a more modern appearance. A few years later in 1911, Brother Michael proposed the construction of a school hall and a chapel. The two were built according to the plans made by the architect C. Hunsley in less than a year. On 23 September 1912, Governor of the Straits Settlements Arthur H. Young officiated at the opening of the new hall, King George's Hall. At the time of its completion, it was one of the largest school halls in Singapore. The hall was designed as an open loggia, which allowed the interior space to be naturally illuminated and ventilated. Due to the late arrival of the stained-glass window from Europe, the chapel’s dedication was delayed until 20 November 1912, with the first Holy Mass celebrated the following day. The stained-glass window was removed during the Second World War for safekeeping; the pieces were unfortunately never recovered. Circular patterns decorate the ceiling, while the floor is covered with brightly coloured tiles. A year after the school's 60th anniversary in 1913, the iconic bronze statue of two children with Saint Jean-Baptiste de La Salle pointing afar was cast and placed just above the main entrance. It was donated by a certain Mr La Salle, a resident of Singapore. The lifelike statue was crafted by the well-known Italian artist Cesare Aureli; it is a half-sized replica of the original statue standing in the central nave of Saint Peter’s Basilica in the Vatican City, also made by the same sculptor. Saint Joseph's Institution was taken over as a hospital for military casualties shortly before the Japanese invasion. During the Japanese Occupation (1942–1945), the school was renamed Bras Basah Boys' School. More than ten brothers were taken prisoners and were interned at Changi Prison. In the meantime, Japanese was taught in the school. Gardening also became part of the curriculum as food was scarce; the brothers and students grew vegetables within the school compound. By the 1980s, the compound of the Former Saint Joseph’s Institution was too small and congested to accommodate the large number of students. The facilities of the 130-year-old school were getting outdated, and the noise from the traffic on Bras Basah Road proved to be a distraction during lessons. In 1988, Saint Joseph's Institution departed from its old campus, and began its new chapter in the modern and larger premises on Malcolm Road. 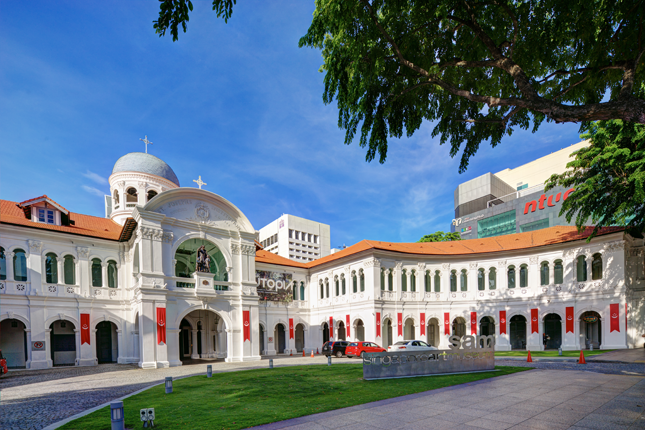 Works commenced on the former school building four years later under the guidance of the Public Works Department to prepare it for its present occupant, the Singapore Art Museum. The contemporary art museum opened its doors to the public on 20 January 1996.